This recipe was inspired by a tapa in an Andalusian bar, in a village surrounded by thousands of avocado trees. The dressing is a version of a recipe I learned from Jim Fisher at Cook in France. There, we used grain mustard and served it on a salad of blanched spring vegetables and poached eggs. I toned it down a little here so as not to overwhelm the avocados. I like this colourful salad so much I’m already imagining variations: crumbled feta cheese on top, for example. 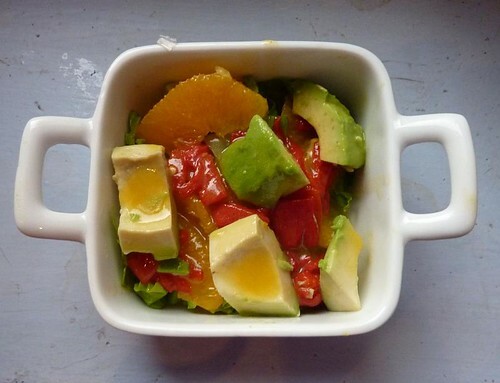 To make the dressing, wash the oranges and use a zester to remove fine strips of zest from two of them. Do this while holding the orange inside a pan so that the essential oils from the skin splatter the pan, not the air. Cut a thin slice from the top and bottom of each orange. Then use a sharp knife to remove the peel and pith all the way round. Hold each of the zested oranges over a bowl, and one segment at a time, slice between the membrane and the flesh on either side, letting stray juice drop into the bowl. Add the segments to the bowl as they are done, then tip into a sieve over the pan with the zest in it. Set the segments aside. Squeeze the juice of the remaining orange and add it to the pan via the sieve. If this all sounds too fiddly, just go to Cook in France and get Jim to show you how to do it. Bring the juice to the boil and simmer till reduced by half and almost syrupy. Strain into a bowl and leave to cool. When cool, add most of the vinegar and the salt and whisk to dissolve the salt. Whisk in the mustard. Then start trickling the peanut oil in drop by drop, whisking all the time. You’ll need about 4 times the amount of vinegar, i.e. 4-8 tbsp, but once the dressing starts to thicken to the consistency of thin cream, start to taste it and don’t let it get too bland. Add a little more vinegar and/or salt if you think it needs it. It should “zing” in your mouth, without being unpleasantly acid. Finally, whisk in a little walnut oil, just enough to give it a nutty flavour. Check the seasoning again and adjust if necessary. Remember it will be “diluted” by the salad. Just before serving, wash and dry the salad leaves and shred them into strips. Cut the piquillo peppers into dice. Halve the avocados, remove the stones, and cut the flesh into dice, then carefully remove from the skins using a teaspoon. For a tapa or starter, put a thin layer of leaves into four small white dishes, and top with a mixture of orange segments, peppers and avocado pieces. Drizzle generously with dressing and scatter with a few halved walnuts. I stole a recipe from my fave Chinese resto in Paris, which “echoes” your salad here.My hybrid salad is with avocado, mango, cucumber. The dressing is with lime juice, Ngoc Nam, brown sugar (portions are about 3-1-1). I do this dressing in the summer when I find the regular vinaigrette heavy. Lastly, love your site, love your recipes. Thank you, mysterious lurker 😉 Have been missing your presence elsewhere! With mango … sounds lovely and must look beautiful!